As last time, I intend to travel light and fast, carrying nothing more than is really necessary. That said, I have learned a few lessons, and will be carrying more to ensure comfort in adverse conditions, including a good under-quilt for my hammock, a warmer sleeping bag and warmer clothing for both paddling and nights. To offset the extra weight, I shall be carrying less food at any one time, using three re-supplies rather than one. Since food is the heaviest single item in my pack, it may be that my overall pack weight is lighter than last time, but that remains to be seen. As it turned out, my starting pack weight was almost identical to last time. The reduced number of days-worth of food carried was almost exactly offset by the larger portions, lower percentage of dried food, and extra warm clothing etc. On this occasion, however, the pack weight never fell quite as far as the food became exhausted. At re-supplies after 2 and 3 weeks, I dropped off some of the warmer clothing, inlcuding heavy dry-pants which had not seen use for several days, so in the latter stages my pack was lighter. My start date is Monday 14th May, and I have a 28-day schedule planned out as my goal. That's ambitious, I realise, but my intended average daily mileage is informed by experience. In 2013 on the Missisquoi I managed up to about 20 miles in a day while the river was flowing at 6+ mph against me. And my progress up white-water, such as rapids on the Androscoggin, Spencer and Little Spencer Streams and Caucomgomoc Stream gives me an indication of how I'll fare against rapids, which to a large extent are intermittent rather than continuous. I expect non-upstream days to be quite long, taking advantage of downstream or of deep lake water to leave many miles in my wake. And I'm hoping that warmer sleeping conditions may make for more restful nights, encouraging me to make prompt starts in the mornings. Of course, it may be that a warmer sleeping bag is more enticing, making it harder to emerge into a frosty morning! My choice of spring to try to guarantee water in the rivers was less successful this time. Certainly, there was plenty in the St John and the Allagash. Indeed, they had been flowing very high just a couple of weeks before I started. Other rivers, though, including the South Branch of the Dead River and the Missisquoi, were low and bony. The good weather that I experienced did not offer enough rain to fill them. My 28-day schedule turned out to be very manageable. I paddled hard and for long hours on several days, and always succeeded in remaining on schedule, sometimes gaining on it and therefore allowing partial days or easier days. My improved sleep system ensured that my nights were warmer, even with some hard frosts early on, and this no doubt allowed better recuperation after a hard day's paddling. The culmination of my 2013 through-paddle was, I'm not embarrassed to say, a pretty emotional occasion. A not insignificant part of that emotion was reserved for my canoe – a mix of pride and affection (yes, affection for an inanimate object). We had shared so much intense experience and emerged triumphant together. 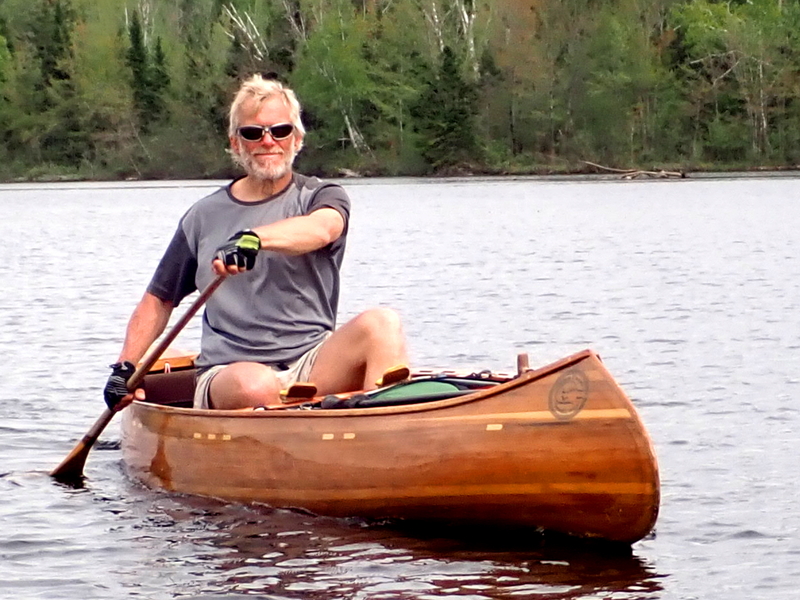 I dubbed my canoe – my self-designed and -built 14-foot solo Sylva – “the little canoe that could … and did!” This canoe served me so well then that I cannot conceive of undertaking this trek in any other. Well, there's not much to say here. Going upstream the long keel line at the bow tended to catch the current, so making steering in rapids awkward, as I had noticed last time. I pulled the pack back as far as possible to alter the trim, but this was not enough. Other than that the canoe performed amazingly, including in waves that topped 4 feet on Lake Champlain. The little canoe that could … did it again! As with my canoe, I shall be using the same paddle that has been part of my paddling for 20 years and counting. This will be my propulsion in all deep water. In white-water and shallow conditions I shall once more use a shorter paddle with wider blade, but not the clunky home-made one of last time. I had an old wooden kayak paddle, made by Mark Gees, left over from my kayak slalom competition days, and it had seen no use for well over 20 years. With a certain amount of regret I cut through the shaft and grafted a T-grip on to the cut end. So I now have a white-water canoe paddle with a curved blade and a reinforced metal tip. I expect it to see much action. My white-water paddle took a bit of a beating, trying to paddle up shallow rapids, but it emerged fully functional, just in need of a thorough re-finish. My long ash paddle once more performed to expectation, although is not used to being gripped quite so tightly. Frequently I had to maintain a vice-like grip to prevent it from being ripped out of my hands by the wind. I suspect my hands suffered from this more than the paddle! This paddle, too, is now in need of a re-finish. Once again I shall use my camping hammock. It's light, easily packed with no rigid parts, erects in just a few minutes, and is comfortable for sleeping. One problem of hammocks is their lack of underside insulation. Last time I used a Thermarest inside, but tended to slip off it, and so ended up with cold spots. Since then I have made an underquilt from an old sleeping bag, and have been impressed by the insulation that is achieved by having lofted material in the right place (duh!) Furthermore, in anticipation of cold nights, I have even made it so that an extra layer can be held in by velcro under my torso and hips, doubling up on the insulation. If it's too warm (yeah, right), it's easy to adjust so that more air circulates. The new improved underquilt was a success. Even on nights when my water bottle, my toothpaste and my boots froze solid, I remained warm. After just under 3 weeks I offloaded the extra layer, it being no longer necessary. The only problem I encountered with the hammock was sometimes a lack of suitably spaced trees in the places that I camped. I was never in the position of not being able to hang it, but sometimes the trees were a little closer than is ideal. In the latter stages in the Adirondacks I was able to hang it inside some lean-tos, therefore not requiring the tarp. On one or two other nights, I forewent the tarp when it was obvious that it wouldn't rain. Once more, I'm drafting my own directions, complete with mileages, obstructions, rapids, carries, towns etc. This, together with the 13 NFCT maps, will be my guide. To a greater extent this time I have focussed on the uptream sections, looking at whether I can realistically make progress and, if not, what alternatives there may be. Of course, I shall not know for sure what conditions are like until in situ, so there will undoubtedly have to be some decision-making and improvisation on the fly. I found myself referring to these directions much less than last time, simply because, to a large extent, I knew what lay ahead. I was mostly interested in the distance to the next featured location. My planning for alternative routes came in useful on the South Branch of the Dead River and on the Saranac. Having established the possibilities, I was more confident about staying in the river bed more, knowing that there were escape routes when the going got too tough. All of the safety considerations relating to my 2013 solo trek are applicable here. Maybe to a greater extent fatigue will be something to take into account, what with being older and facing more upstream. I shall be carrying a SPOT Satellite GPS Messenger, and thereby able to summon help if necessary, either from my support crew or from relevant emergency services. This device will also leave waypoints online and send check-in messages to my support crew, so they will know how I'm proceeding (if not how I'm feeling). The main danger that I faced was an injury from slipping on rocks when wading up rapids. On more than one occasion I recognised that fatigue was making this more likely, and took the hint that I should leave the river bed and choose an alternative route. I used my SPOT to send reassuring messages to my support crew, such as having cleared the pull of Allagash Falls, or my continued progress at the end of a tough day when battling into a ridiculous headwind on Moosehead Lake. For the first time ever I sent a message other than “OK”. When lost on the Mud Pond Carry (or, strictly, not on it), I sent a “Delayed” message to alert them that I was in a spot of trouble. That was followed a while later by “OK” when I had finally extricated myself to a known location. Here I shall put into practice a lesson learnt last time. I shall carry less food at any one time, but have more re-supplies (three instead of one). My meal portions will be a little larger and definitely more calorific. They will also contain more protein. When your body develops very specific cravings, it is telling you that something is missing. I aim to avoid such cravings, and, in doing so, to fuel my body better for the undoubtedly large work-load that it will experience. I got the food almost right. It fuelled me well and I developed no cravings. My breakfast bars were home-made granola glued together with home-made almond butter. The high protein and fat content worked very well. What I hadn't foreseen was that warm weather would melt some of the butter and coconut oil, allowing it to escape, making these extremely messy. Sometimes I even hoped for a cold night! Dinners were of the right sized portions, and, although I sometimes thought about eating a double portion to get rid of occasional extras that I was carrying, one serving was always sufficient. I made and carried too much fruit-and-seed trail-mix, and began to tire of this after a couple of weeks, but it was good fuel. I shall carry the same MSR water filter with SiltStopper pre-filter as last time, together with a Camelbak bladder as a reservoir for those bodies of water that are better not to drink. The only thing that went wrong with this system was that I broke the spare Siltstopper filter. It was packed in the first aid bag, and got crushed, not having any protection. That's annoying because they're expensive, but fortunately I had no need of it. When lost in the heat of the day near the Mud Pond Carry, I ran out of water. The filter came to my rescue when I found a very small marshy puddle with some standing water, and managed to pump two-thirds of a litre before it clogged. Another lesson I learned last time was that a twig stove works well if there are any twigs that are not totally saturated with water. Having been unable to cook on several occasions in 2013 due to a lack of dry fuel, I shall carry, in addition to my Emberlit twig stove, a small gas stove and cylinder, ensuring that I shall always be able to prepare hot food and drink. The extra weight is an investment in looking after the body of which I'm expecting a lot. I shall also be carrying a bag of dry birch bark as tinder for the wood stove, at least giving me a fighting chance of getting it started. This was another success story. When the wood supply and time permitted, I used the Emberlit twig stove, and it worked fine, there being very little rain this time. On occasions however, I chose to use the gas stove so that I could multi-task. At the end of a long day when making camp late, I could set water to boil while, for instance, changing clothes or hanging the hammock. The twig stove demands constant attention, so does not allow this. As a contrast with last time, there were no occasions on which I was unable to prepare hot food and drink. I'm a committed carrier. Wheels to me represent extra weight to lift out of the water at every carry, extra weight to carry on unwheelable portages, and potentially several pounds of junk to be carried when they fail (as many have done). I have a light boat and shall pack reasonably light, so expect to be able to carry all with comfort, making 3 mph on good terrain. This worked well last time; I see no good reason to change. At times, especially after about 11 miles along the Dead River, my shoulders were screaming for wheels, but once more the decision to carry is one I do not regret. In fact, along the Dead River I was travelling at more than my usual 3 mph, and this nearly led to a navigational error. On two days I carried 17 or more miles. That certainly had an effect on my body, making it difficult to straighten out for a while, but even this has not persuaded me that wheels would have been the right choice. I expect my training to be similar to last time, a mix of back-country skiing, running, free weights, paddling (once the ice is out) and so on. One thing that I shall do more of this time is to walk, laden, in the shoes that I shall be wearing, just to ensure that my feet are ready for them. Mental fitness is something that is hard to nail down. I'm busy planning my way along the trail, trying to foresee problems and solutions, but there's a limit to how much of that can be achieved. For a long time I merely felt daunted by the prospect of this journey. It was not until December 2017 that I began to feel a sense of excitement in addition, and it was that that allowed me to commit to the undertaking. The balance of excitement and apprehension keeps fluctuating, but so far has not swung back to seeing this as nothing but an uphill struggle. My training was significantly supplemented by the harvesting of wood. I spent a large part of the early spring felling, hauling (by hand), cutting and splitting a few cords of wood to re-stock our woodshed, which was sadly empty. All of the other activities played a part, although I more or less abandoned the free weights after suffering a shoulder injury just a few weeks before starting. About 2 weeks before starting I received news of significant ice on the Allagash headwater lakes and excessive flow on the St John and Allagash. This worked well to plant doubts in my mind. Of course, it was better to be informed than not. Over those 2 weeks I watched online as the river gauges indicated levels falling towards more seasonal norms. It was not until reaching Fort Kent, however, having invested time amd money in making the trip, that I knew for sure that I would be able to paddle up the St John (and presumably the Allagash). Having totally failed to line or track last time, I suspect that this time will be no different. To that end, I'm going to shorten my bow and stern lines to make them lighter (they'll still be long enough to join together to hang my bear bag). I'm sure there will be some tracking up rapids, but I'm not convinced that I shall be able to control my canoe by means of lines, so will probably, as last time, wade with a hand on the gunwale if necessary. I spent far more time wading in the water than I had expected, having found that it was often the most effective way to make progress. Sometimes I used the bow-line to lead the canoe. Sometimes I had a hand on the bow deck thwart to give more control over direction. Sometimes I used one hand on the bow-line and one on the gunwale to manoeuvre through technical rapids. Once again, I never manoeuvred my canoe by means of bow- and stern-lines alone. Vegetation on the bank or slippery rocks underfoot made that a non-starter for me. Someday I must learn how to do that properly! Having had so much success last time with double poling (and, indeed, having submitted an article on this technique to Small Boats Monthly magazine), my ski poles will accompany me, and will probably see a lot of use, depth of water permitting. They will be strapped in the bow, easy to grab when necessary. And a ski pole makes a very useful walking stick when wading on slippery cobbles. This was working fine until half way through day 3. I had poled up several miles of the St John and Allagash. It was one of the very usable tools in my tool-chest. On day 3 this changed - I lost one of the poles. I still had one to use as a walking stick for support when wading, but poling was now out of the question. The weakness of the system came back to bite me (again!) At re-supply on day 13 Ray found a spare ski pole of about the right length, so I could once more pole, and did so up substantial parts of the Connecticut and the Saranac Rivers. In 2013 I intended to check into indoor accommodation about once a week for a shower. In reality, I was glad to get inside out of the rain and cold on several more occasions. This time I shall not balk at splurging on some comfort, if any is to be had at the ends of my days. I stayed at Jackman Motel (planned), North Country B&B, Rangeley (unplanned), Down Home Motel, Groveton (unplanned), Grey Gables Mansion B&B, Richford (planned), Swanton Motel (unplanned) and North Hero House (unplanned). The unplanned ones were without exception vast improvements over the alternative. The planned ones had been so good last time that I built the schedule around them.